Recently the South African Minister of Finance announced a tax change of 1% effective from 1 April. What will this mean for your business and how will you implement the changes in your operations? We’ve prepared a document to guide you through. Please note, this is our advice and experience and we are not responsible for the decisions or actions taken in your business operations. In his Budget speech, Finance Minister Malusi Gigaba advised that, for the first time since 1993, South Africa will be facing a 1% VAT hike to be implemented on 1 April 2018. During his speech he listed many more areas which will see tax changes emerging. What’s changing? VAT, personal tax (although the increase will be below inflation and only apply to the bottom tax brackets), sinner’s tax, fuel levies, donations tax, excise duties on luxury goods and estate duty. See Businesstech.co.za for a summary. Medical aid rebates, capital gains tax, company tax, dividend withholding tax. In addition to these policies Gigaba outlined the mechanisms to source taxes from different sectors – see CNBCAfrica.com for more details. The message was clear, SA government plan to source more tax money across the board. You can argue about the fairness, you can debate the timing, what you cannot do is avoid the reality that it’s here and you have to decide how best to handle it in your business. In tourism, especially in the luxury safari industry, rates are determined well in advance of travel. Most accommodation suppliers cater for group bookings and international travel which is often booked 12 to 18 months in advance. Part of their success requires releasing rates far in advance so international operators can prepare and print their travel products in brochures. This makes short term rate adjustments complicated and needing thought and discussion before choosing your response. This blog outlines our experience when governments have introduced VAT and tax changes across the continent. We have included our understanding of the situation and samples of general fiscal changes and how they were managed which may help preparing for the SA VAT change of 14% to 15% from 01 April 2018. What is the operational ruling around the tax change? This will help you determine the best way to implement the changes in your business applications. As a business should we increase our rates or should we absorb the tax? Take counsel from your auditors, marketing teams, rates and reservation managers. Don’t rush in following your neighbour’s strategy as it may not make business sense for you based on your margins, business relationships and corporate taxes. What is the best way to implement the change in my system? This is dependent on the ruling around the tax change. Government may be prepared to accept conditions such as honouring 14% for bookings that already have deposits recorded or bookings already invoiced; however, there is no indication of this and we assume that legislation will be based around SA ruling that VAT becomes payable on the date of an invoice. How should I notify my trade partners? Advising the trade of the change is tricky, it’s important to be honest about your preferred choice and your reasons for the decisions you’ve made. Consider sending an announcement to your partners that there are changes coming and that you’re identifying the best option for all parties. Follow-up with details of your choices as soon as you’ve made them. VAT becomes payable on the date of invoice. Thus the ruling VAT rate at that date applies. Operator terms and conditions are likely to include a statement that rates are subject to statutory charges, such as VAT. Thus there is not likely to be any legal impediment to increasing contracted rates to account for the VAT increase. If reservations travelling on or after 1 April are invoiced before April, it seems that 14% VAT will apply. However any changes to those reservations subsequent to 1 April will require variation credit notes and / or invoices, which will attract VAT at 15%. A business has the option of either absorbing the VAT increase, or passing it on to the customer. Absorbing the increase means paying the 15% VAT but not recouping the additional 1% from the customer. Alternatively, the business can pass the cost on to the customer, which means increasing rates to include the 1% increase. If the customer is VAT registered in South Africa, the increase will be recouped via their VAT input submission. They will then be faced with making the decision about passing the cost on to their end customer. The significant factor is whether the service is delivered before 1 April, or not. Timing of payment is irrelevant except in the case of an operator that is specifically authorised to pay VAT on receipt of payment (a rare scenario). It could be argued that VAT is payable upon receipt of a deposit payment but we have not encountered this practice in South Africa. The existence of contracted rates with customers is not relevant. Payment status of the booking (consider the different implications of a booking being unpaid / part paid / fully paid). The value of the booking (assess the scale of the cost should you choose to absorb the cost and assess the potential fallout if you increase the rate). Lead time to arrival date (agents are more likely prepared to accept rate changes if they have enough time to notify their clients). The extent of the practical overhead of changing rates and services (consider the time to publish new rate sheets, make adjustments to your system rates and re-price existing reservations). Change the tax settings in your sales system. Reprice all affected reservations that will be invoiced on or after 1 April. Advise all customers of the change. Amend the amounts on your rate sheets. Change tax settings in your sales system. Change rate amounts in your sales system. Reprice all reservations that will be invoiced on or after 1 April. Some clients indicate that they will absorb the VAT change for a 6 month window from April, thereafter rates will be increased to accommodate the change. Some clients indicate they will absorb the VAT change for 2018 and will adjust rates in 2019. Some clients indicate they will absorb tax on bookings that are confirmed and have a deposit already paid before 01 April. The supplier will absorb the change of VAT in these cases. If the booking is provisional, with no deposit, they will adjust pricing to a new rate which caters for the 1% increase, before confirming. VAT 411 Guide for Entertainment Accommodation and Catering – External Guide The guide for accommodation and catering (VAT 411) gives more focused information on the accommodation industry. Chapter 7, page 47 is the most relevant. I’ve made up my mind, now I need to change my rates, extras and bookings in ResRequest. What next? If you use ResRequest to track your taxes on your room rates and / or extras, you’ll need to change your taxes on all affected bookings, rates and extras. In all likelihood you already have bookings that will be invoiced after 01 April 2018. These bookings will need the new taxes applied to extras and accommodation rates. There’s no way to work around it – you have work ahead! We’ve highlighted the key steps to follow below. Add a new tax rate of 15% in your system. You will need this to change or create your 15% extras and room rates. WARNING! You may be tempted to edit the 14% to 15% – this will not have the required effect and will negatively impact your taxes. The 14% tax rate must remain on the code table for historical bookings and for reporting. The new tax rate must be a new tax rate record. From the main menu select: Administration > Setup > Code tables > Tax Rate. Then add the new 15% tax rate (create a unique, recognisable description). See our online Tax Rate Code table for more guidance. See our recommended online below. Add more Fields as required so the report includes everything you need for your reservation and accounts team to review after the changes. 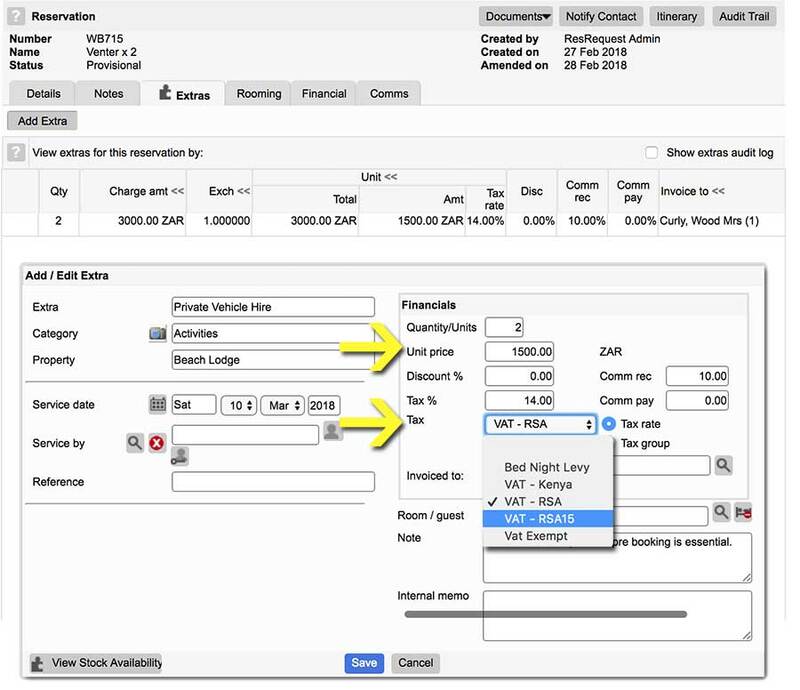 3.1 On future bookings already created, that require the new tax, change Extras to use the new 15% tax rate (the Tax % will update automatically) and change the Unit Price if you plan to pass the increase to customers. In addition to editing all affected bookings, do this for all new bookings. 3.1.1 You could duplicate your Extras so each VAT-rated Extra has a record for 14% and a record for 15% – this is feasible if the volume of extras you manage can be cloned. 3.3 If you are tracking camp-based guest extras, remember to update those extras for your front-of-house teams! 4.1 If you plan not to change your room rates, it will be less work to continue as normal, i.e. with no changes, until 01 April 2018. We recommend adding a note to your documentation or Terms & Conditions advising that taxes will be changing from 01 April which will show on documentation after the 01 April. From 01 April 2018 invoice everything that should raise 14% tax i.e. where the invoice date is prior to 01 April. The next step is to change all your affected room rate components, across all your rate types and future periods, from 14% tax to 15%. If you have a high volume of rates, ResRequest can help as we have a tool capable of making wide changes to rates. Contact us if you have a high volume of rates that are impractical to edit, we’ll quote you for our time and project management for this data change. If you’d prefer to make the change from the front-end, review our Rates Guides for a refresher on rates setup. The next step is to regenerate all bookings where the new tax and / or amount will be applied, review our Regenerate Folios Guides for help. 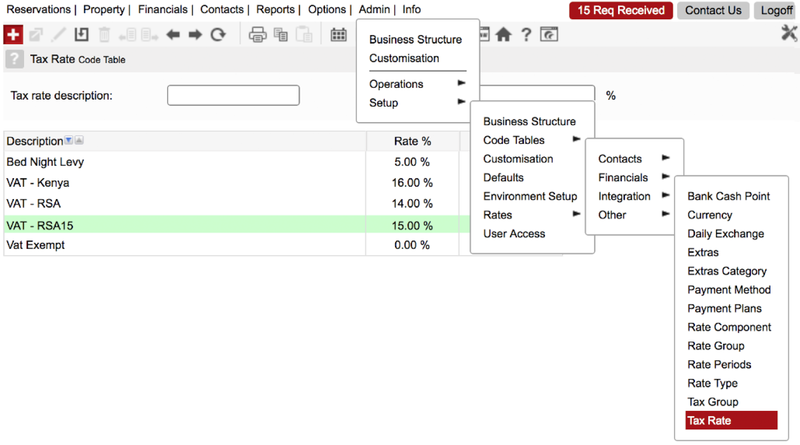 4.2 If you plan to change some or all of your rate amounts, edit your rate periods. Next add new rates – it’s recommended you clone the rate using the Copy / Add rates function. Once you have created the cloned rates for the new period, edit them to apply the 15% rate and any rate amount adjustments required. If you have a high volume of rates ResRequest can help automate rate amount changes using a tool that can change all amounts by a specified percentage or fixed amount. 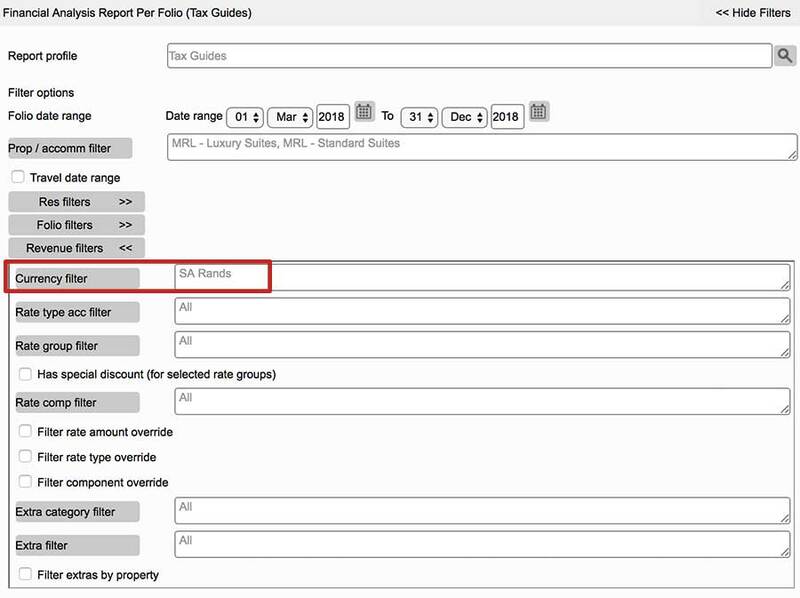 Next remember to change all affected future bookings to use the newly created rate types. Changing the rate type will automatically recalculate the room rate. Remember to explain to your staff what the different rate names are and under which conditions to use them. Remember to update your online platforms if you’re working with channels managers and to notify your business partners of the changes. At relevant dates deactivate old Extras and Room rates as they become obsolete. If you are a South African customer and you are struggling to come to terms with your decisions and operational changes, please contact our Call Centre for a chat on how best to setup your strategy.